Happy New Year to all our customers! We hope you had a truly blessed Christmas and a Joyful New Year, we have been very busy at Simple Blessings – adding new stock and preparing for Easter, Holy Communion and Mothering Sunday. We have ordered some beautiful Holy Communion gifts and Holy Communion rosaries for the New Year, and we’re including some ‘My First Missals‘ and Catholic Bibles to the site very shortly – the photographs are being processed as we speak, so hopefully they should be on the web site in no time! Many gifts exclusive to Simple Blessings will also be added shortly. We currently have a New Year sale in progress at the moment – as our sale was very popular last year, we thought it was time to sell off some old stock again – and make way for something new and refreshing! The sale is doing very well and many of you are buying the last of our christmas decorations and angels. We have also added a new range of Bereavement gifts to the web site, they provide a beautiful collection of sympathy gifts for the grieving or bereaved. We have a solar powered grave lantern, memorial praying hands light, a battery grave light, grief prayer cards, memories resin prayer plaque, pewter photo frame in loving memory, thinking of you wooden cross and a porcelain sympathy cross on sale. We hope you can find a suitable gift which may bring some comfort to the bereaved or grieving. Our Saint Statue range is steadily growing too and we’re thrilled to see the new Tea-Light Saint Holders being one of the most popular items on this page! 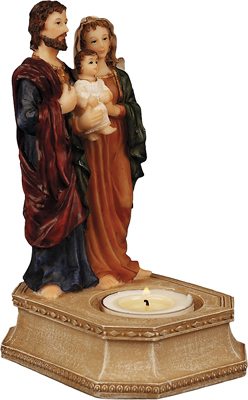 The Holy Family tea-light holder was very popular over the Christmas period and we hope it may continue to enlighten you (excuse the pun!). Please click here to the view our lovely Saint Tea-Light Holder page.